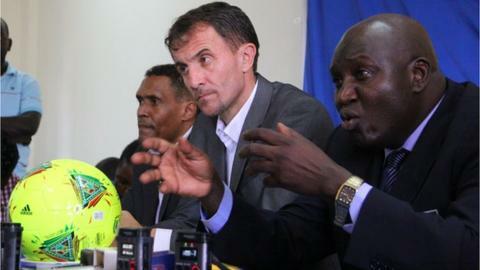 Uganda coach Milutin 'Micho' Sredojevic has voiced his concerns over the fixture schedule for the 2015 Nations Cup qualifiers. Forty-nine teams will be whittled down to 15 over only six months. Micho's side will have to play 10 matches to reach the final in Morocco. "I would not call it pressure but it is very tight," he told BBC Sport. "If it was in Europe it would be easier because of better logistics and flights. In Africa there are issues." He added: "We will have to make sure we are ready for what is in front of us and plan in advance. It is a very big challenge for all of us." Uganda have been drawn against Madagascar in the first round and would, if successful, go on to play the winners of the tie between Mauritania and Equatorial Guinea in the second round. Should the Cranes come through both those two-legged ties they would then be placed in Group E alongside Ghana, Guinea and Togo.